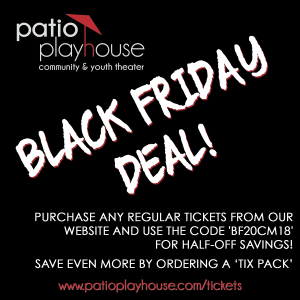 Patio Playhouse is offering 50% off regular priced tickets from Black Friday until midnight, Monday the 27th. This discount is good for any show remaining in our season AND our ‘Downtown Tix Packs‘ (which already offer a 15% discount off list prices)! Simply use the code BF20CM18 at checkout.